For the joy of its fans, the third part of the Hunger Games movie has been recently released. Stared by Jennifer Lawrence, Josh Hutcherson, Liam Hemsworth and others, this part continues the story of the dystopian futuristic trilogy authored by Suzanne Collins and rolls out the peak of the uprising against the Capitol. 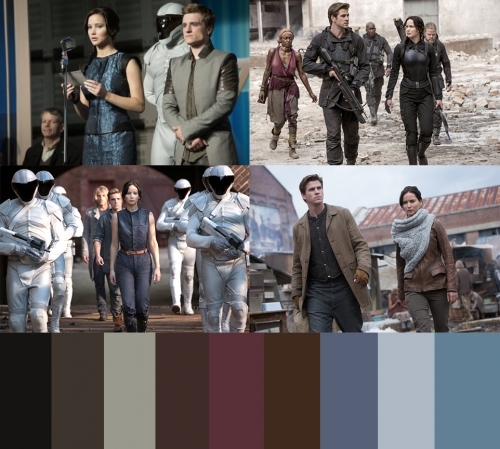 Aside from the immense technical work, a special attention was paid and a huge work was done to design the costumes of movie characters, because it should have reflect the futuristic society of Panem divided into colourful Capitol and gloomy districts. As from the interviews with costume designers and stylists of the movie, the idea was to reflect the author’s imagination on the screen and create unique looks for every character in the movie, even for the 500 extras for the party scene. Interestingly, if you watch more carefully, you will notice a shift and a transfer in the people’s style and fashion throughout the three movies, which reflects the natural development of fashion through time. 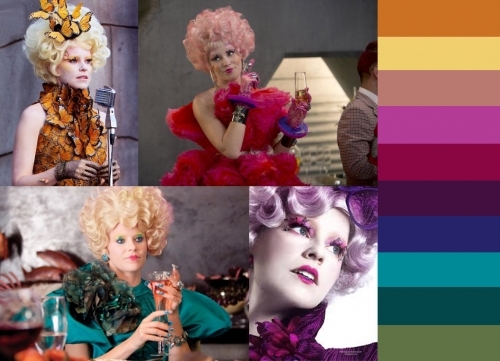 To break down the style chosen for the movie characters and looking from the broader perspective, a very distinct difference in tones and styles is apparent for the population in Capitol and districts (designers made efforts to differentiate styles for each district separately). Keeping the layers of society very distinguish in the book and the movie, the difference is apparent from the first look. While the people in Capitol are extremely bold, dressed in vibrant colours with dyed hair in unbelievable shades and eye-catching make-up, the population living in districts wear old clothing in muted colours prevailed with grey, khaki, black, dark blue and brown highlighting washed-out tones. 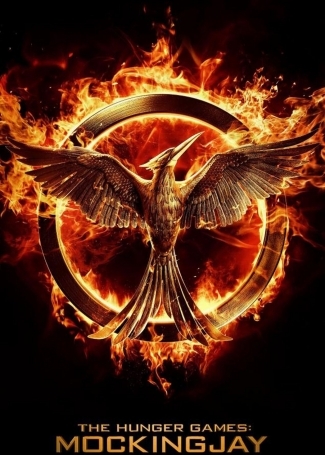 Throughout the movie, when the story develops, the main hero – Katniss Everdeen – becomes a symbol of a revolution against the Capitol. Consequently, her appearance becomes inspirational for everybody following the uprising. Not only this character has inspired the futuristic society, but also the current 21st century people are prone to dress like Katniss or other heroes of the movie. That is why I have created a number of sets inspired by Hunger Games, which reflects the clothing of both district areas and Capitol. And here are some sets reflecting the style and soul of the Capitol - bold, colourful and vibrant - all extremely eye-catching.